When I first started collecting old Boatanchors, I was enamoured with the Hammarlund monicker. After doing this for awhile now, National RadioCo. has a place in my heart much as Hammarlund does. 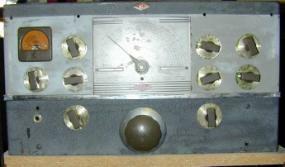 James Millen built some awfully nice radios and his designs that made use of removeable coils or sliding “catacombs” transcended decades. I have refurbished several HRO’s now as well as taken apart and lubricated my share of sliding catacombs. Witness the mechanism used to switch bands, perform main tuning and bandspread all with the same knob as on the NC-200 Anniversary or NC 2-40D, and you’ve got an idea of the engineering that went into the Nationl product line. Who can forget those pewter looking feet of the NC 2-40D flaring out majesticly in the light of a well lit hamshack or living room. 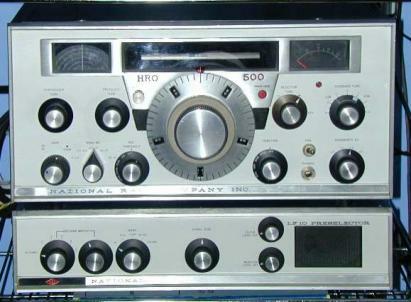 Looking at the infamous National dial knob and rounded surfaces of the HRO-50’s and 60’s, one might think he was in the cockpit of a Buck Rodgers spaceship. 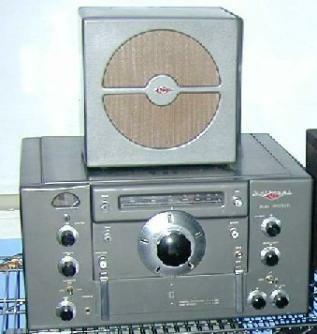 And all those coils … Whatever happened to the coil boxes ? This model uses the famous catacomb method of band selection. In a nutshell, instead of using a bandswitch to switch in and out all of the RF and multiple IF section coils, with wire flying everywhere around the bandswitch section, the “catacomb” is an actual cast aluminum housing containing all those RF/IF section coils that moves on a rail system underneath contacts. When the catacomb gets to a certain position on the rail that, lets say where the 5.0 – 15.0 mc band is supposed to be, the appropriate coils are making contact. Mr. Millen theorized that there was just too much signal loss with all those wires flying around everywhere using a bandswitch. power supply and another with an external “doghouse”. Mine is the latter. 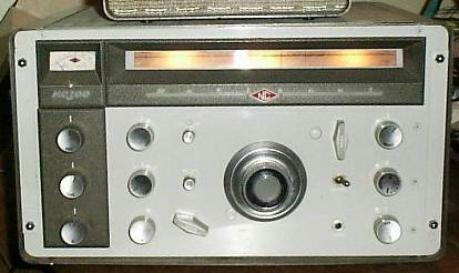 Because this receiver has a second rf section attached to the back which is known as the “back porch”, it also has two separate catacombs. 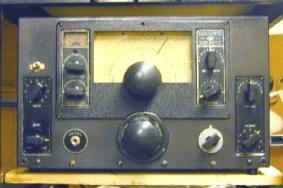 This is a NC-46 receiver. It’s a so-so performer most known for its art deco design. Here is one of my favorite receivers, the HRO 50T1 with speaker. This teams up with a Johnson Valinat for the Number one station. 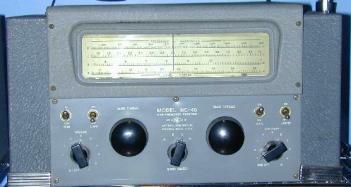 This is ,of course, the NC-300 ham band only reveiver. 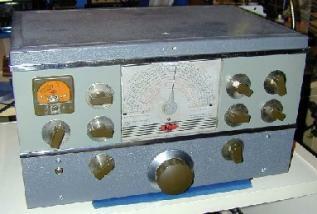 It is very nice sounding and does a very respectable job on AM, CW and SSB. 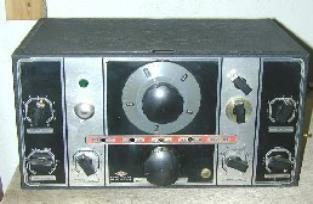 It is the receiver I use for my Vintage Sideband Station.